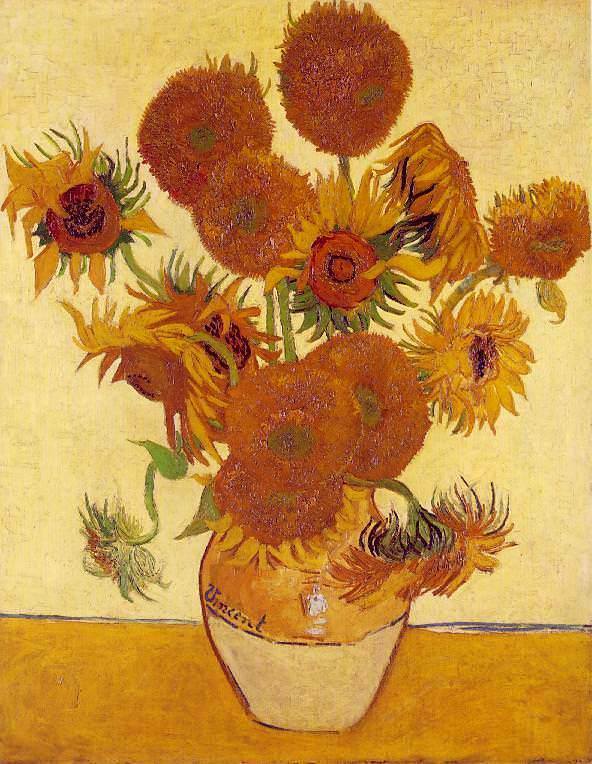 The Sunflower gets its name from the sun – helios is Greek for Sun, & anthos for flower. 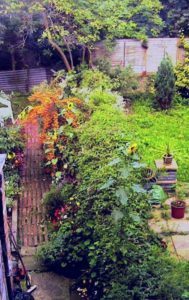 Leaves of this annual are stiff, & its tall fibrous stem may reach over 3 metres. The large flowerhead is a central disc from which its petals radiate. Tiny flowers spiralling round the disc are visited by bees; after pollination each flower becomes a seed which is rich in oil & pecked up by the birds. 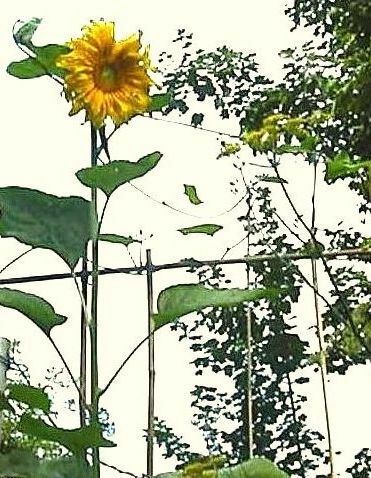 Sunflowers follow the sun (heliotropism). A young sunflower will face the sun when it rises in the east. As the sun travels across the sky through the day, the flower turns to follow it. When the sun sets in the west, it leaves the flower facing west. Overnight, it turns back to the east. Older flowers lose this ability to turn. Sunflower seeds are rich in Vitamins B & E. The colours of Sunflower cultivars range from YELLOW through ORANGE to REDS & RED-PURPLES. 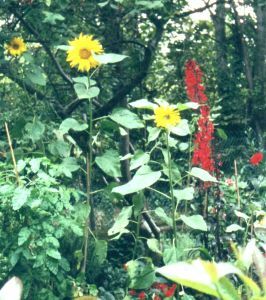 Records for sunflowers have included the tallest (25 ft (750 cm) tall, grown in the Netherlands) the largest sunflower head (32 1/2 in (80 cm) across, grown in Canada) & the shortest (just over 2 in (50mm) tall, grown in Oregon using the Bonsai technique. The sunflower is listed as one of The best garden flowers for bees on the University of Sussex’s website from the Goulson Lab. Prof Dave Goulson is founder of The Bumblebee Trust & author of A Sting in the Tale. Adityabhakta, Corona Solis, Fleurs de Soleil, Grand Soleil, Helianthe, Helianthi Annui Oleum, Huile de Graines de Tournesol, Marigold of Peru, Tournesol, Witches’ Cap. Sunflower cultivation, for oil and food, has a history that began with Native Americans and owes much to the Russians and the Europeans. Jeanne Rose’s Herbal, HERBS & THINGS, Grosset & Dunlap, Workman Publishing Company, New York 1972. ” The American Indian first domesticated the sunflower into a single headed plant with a variety of seed colors including black, white, red, & black/white striped. Evidence suggests that the plant was cultivated by American Indians in present-day Arizona & New Mexico about 3000 BC. Some Native American tribes used the sunflower as a source of yellow and orange dye for fabric. It was known medicinally for its antimalarial properties. Sunflowers were seen as symbolic of courage by some native peoples, & warriors carried sunflower cakes with them into battle. The sunflower originated in South & Central America & migrated north, most likely due to the migration of Spanish conquistadors. Remains of sunflowers dating back 4,600 years have been found in Mexico. In the 1500s, Spanish explorers took sunflowers back to Europe with them, & the species has spread around the world since then. ” Taken to Europe by Spanish explorers some time around 1500, the plant became widespread throughout present-day Western Europe – mainly as an ornamental, but some medicinal uses were developed. 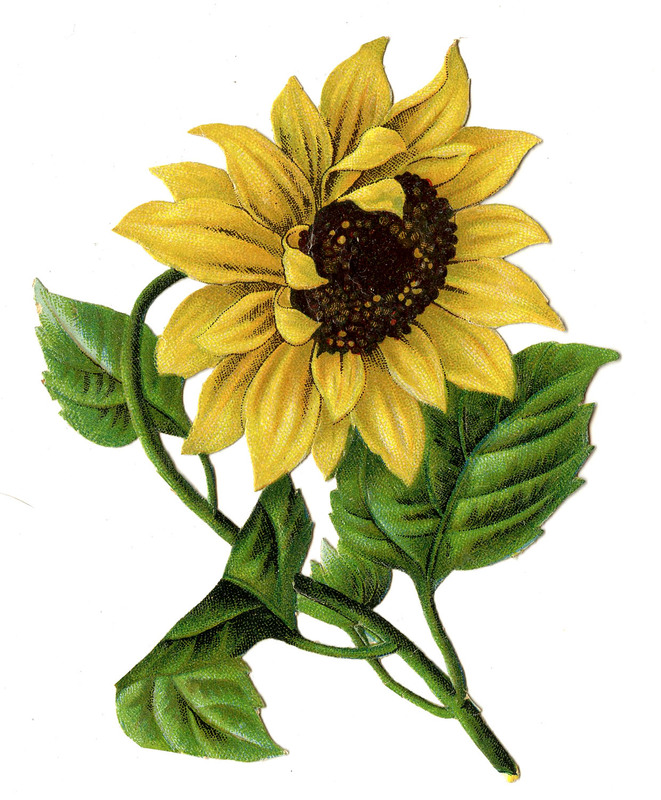 By 1716, an English patent was granted for squeezing oil from sunflower seed. We have found sunflower seeds to be the favourite food for sparrows & other small birds. 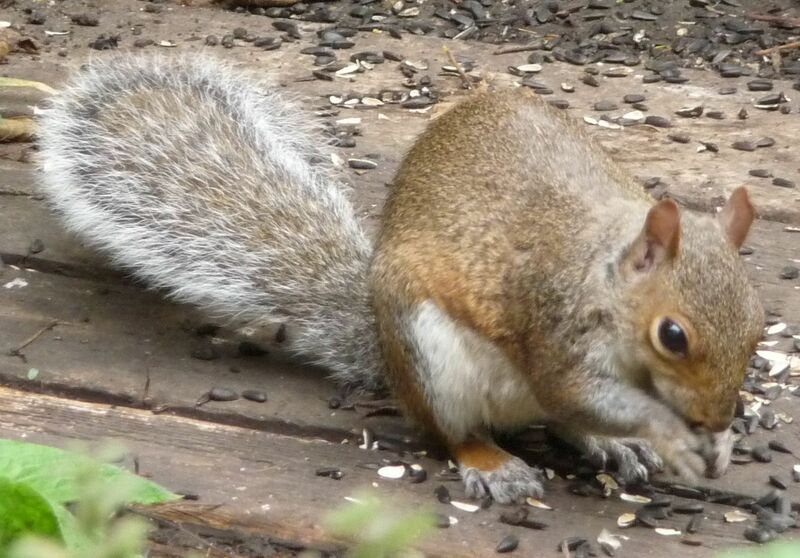 We buy ready shelled seed as well as black sunflower seeds in their shells, & there are feeders for those seeds. Black sunflowers seeds have more oil than striped seeds, & are favourites with the birds. 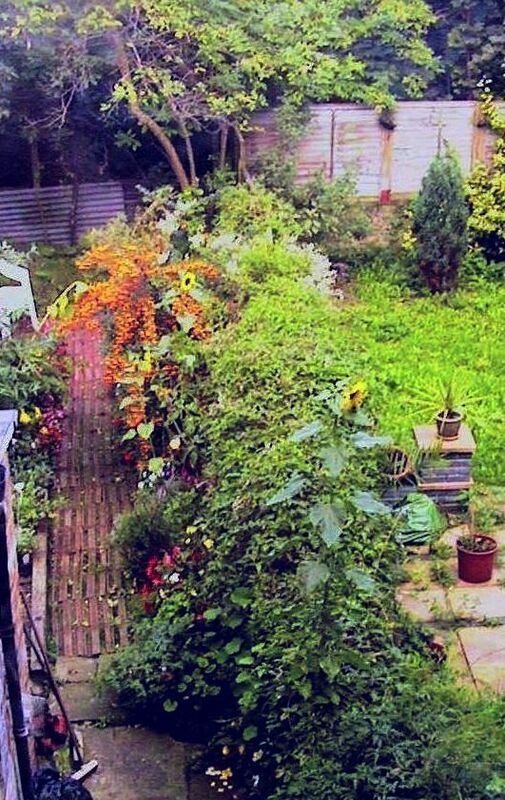 Monika, who lived here before I moved in, persuaded RF to try growing sunflowers in the garden. They would be wonderful to look at, & birds could eat the seeds. He did his best, planting seeds year after year. 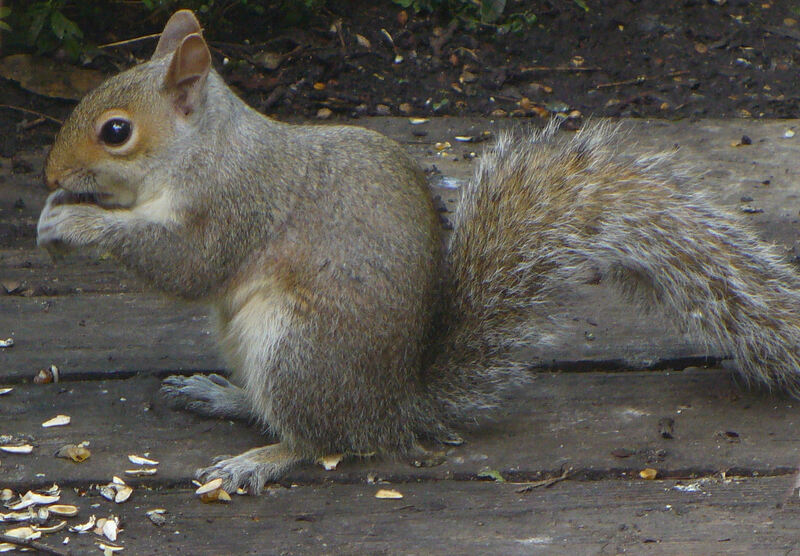 Sunflowers grew from the seeds – on stalks that were 6ft or taller – but the plants were always brought down by squirrels just as the seeds ripened. Captured flowerheads were bitten off & dragged to the top of the brick wall, where all seeds were devoured. If you want to grow sunflowers & there is a strong squirrel population in your area, you may need to adopt a cunning plan to outwit them. 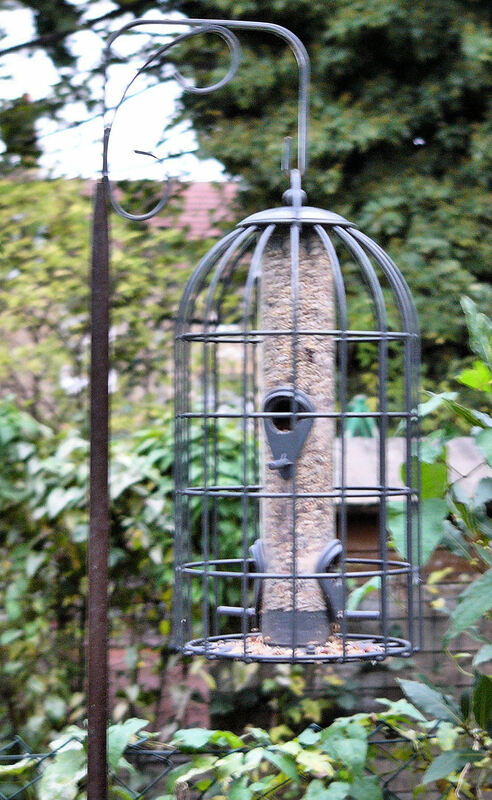 Sunflowers have gone from North America to Europe to Russia, from there to the USA & Canada, then back to Europe… Here at our garden we currently get sunflower seeds by mail order in large sacks from two suppliers: Little Peckers in Hertfordshire who import their sunflower seed from Bulgaria, & the RSPB.